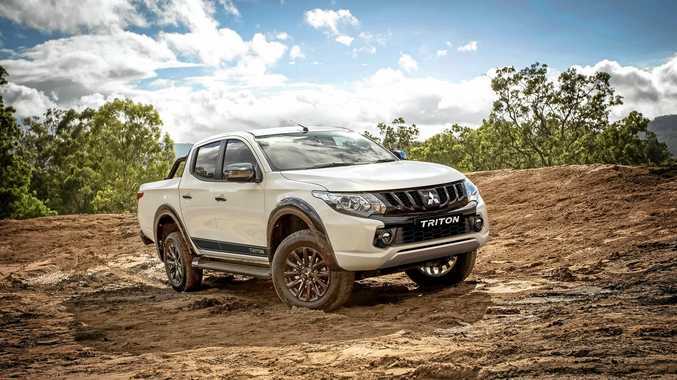 This limited edition Triton Blackline model based on its popular 2018 GLS 4x4 Double Cab. FIRST there was the Nissan Navara Black Edition, then the Holden Colorado LSX, now Mitsubishi has launched its own souped-up dual cab ute. The limited edition Mitsubishi Triton Blackline is based on the 2018 GLS 4x4 double cab, but comes with a range of macho extras and is priced from $43,490 plus on-roads. Extras include push button start, rear differential lock, tub liner, carpet mats, as well as black features such as mesh grille, door mirrors, fender flares, side steps, sports bumper and rear step bumper, door decal as well as 17-inch alloys. Other standard features, also found on a standard GLS, include keyless entry, smartphone connectivity and reversing camera. It's available in three colours: black, starlight and titanium. The Mitsubishi Triton Blackline starts from $43,490 plus on-roads with a manual transmission partnered to the standard 2.4-litre turbo diesel. The automatic commands a $2500 premium.